My first experience with a request for equitable adjustment (REA) was brief and decisive. The O-6 program director didn’t literally drop it in the trash bin, but he clearly wanted to. His message to the development contractor was to not expect any action by the government, despite the contractor fastidiously mentioning it month after month on a chart listing unresolved contracts business. The REA resulted from a technical disagreement between the contractor and the government regarding how much in-scope testing was required to properly resolve a spacecraft test fault. According to Federal Acquisition Regulation (FAR) subpart 43.2, a contractor requests equitable adjustment — essentially a type of proposal — in response to a unilateral contract change order, but other unplanned changes to contract terms, such as a late delivery of government furnished property (GFP) or disputes over scope, can lead the contractor to send an unexpected REA. In the daily life of a program office, REAs are rare because planned contract changes are accompanied by requests for proposal. Likewise, when the contractor and government agree about an unplanned change, the program manager (PM) would treat the REA similarly to any other proposal. However, when the REA results from disagreement on contract terms, delay of work, or scope (either in type or magnitude), the working relationship may become tense if it isn’t tense already. Both the government and contractors must weigh issues of fairness and duty to stakeholders when deciding how to proceed. Decision making may become emotionally charged, to the detriment of the relationship and program progress. In the situation described above, the REA was a small blip that did not threaten the program’s overall success — we had an enormous cost-plus satellite contract and recognized the need for all parties to work together to get the spacecraft to the launch pad. The issue slowly died and eventually went away. In that instance, it wasn’t a bad strategy for the government, but it was not the ideal learning experience for a young field grade officer on how to deal with the situation in the future. Years later I joined an Acquisition Category (ACAT) I equivalent, open-architecture development program using multiple fixed-price contracts with interdependent (but competing) developers. Team members knew going in that we had the perfect environment for spawning REAs. Not only does the government have a duty to respond to contractor requests for adjustment, but unlike my previous experience on the satellite development program, here even a modest REA had the potential to derail the program. The willingness of the associate contractors to work with each other would quickly degrade if they distrusted the government to enforce the assumptions and terms of each contract. The actions a contracting officer takes to respond to an REA are clearly outlined by the FAR and Defense Federal Acquisition Regulation Supplement (DFARS), but nothing similar exists for technical evaluators. The standard process for evaluating reasonableness of proposed costs is meaningless if there is no way to analyze whether claimed impacts were in scope in the first place. When the first REA arrived from my open architecture integrator for “low-quality GFP,” we looked for standard guidance on how to handle REAs. Finding none, our team developed a methodology to determine whether REA claims had merit. Taking the contractor’s claim seriously and conducting a dispassionate analysis keeps the interactions professional and de-escalates emotions. Defining an objective process upfront increases acceptance of the result and perhaps more important, it shows that the government is exercising due diligence. The process we developed includes a flow chart (Figure 1) and a six-step evaluation methodology. It is intended for PMs and action officers conducting a technical evaluation of merits and quanta of the claims and complements the contracting officer’s evaluation. Step 1: Establishment of facts. List all of the claims made by the contractor and sort them into facts the government agrees with upfront and those which require further substantiation. Statements about which the government has no direct knowledge or a conflicting opinion should not be agreed to upfront. Usually the chain of events can be agreed upon by all parties, but a claim that GFP was inadequate (for example) will require supporting evidence. It’s the contractor’s responsibility to provide such evidence. This step forces the government to articulate and understand what exactly the contractor thinks happened, what it wants, and on what grounds. It establishes the major issues of the REA. It defines the points the government must address in the analysis and for which the contractor must provide support. Step 2: Examination of scope. The contract statement of work (SOW) may or may not be very specific. However, in a scope dispute, all relevant paragraphs must be brought forward and considered against the claims. It’s helpful to quote all relevant SOW language and contractual clauses directly in the writeup to facilitate the work of other reviewers. This is where program management needs to confront the truth of how a contractor could have ended up performing out-of-scope work. Going for a quick and easy kill on scope by broad-brushing the topic will not satisfy anybody, and it probably won’t stand up to legal scrutiny, if it comes to that. The evaluator should use the relevant contractual language to conclude whether the work was out of scope. If all parties agree on this point, say so. If not, the reviewer needs to present a more detailed argument as to why the work was in scope or not. Sometimes comparison with the text isn’t enough. The quality or condition of GFP may not be explicitly defined in the contract, but it’s not an excuse to stick the contractor with the added cost of dealing with unreasonably low quality GFP. Contextual factors such as proposal assumptions, reasonable person tests and possible interpretations should be discussed. Step 3: Review contractual direction. A contractor cannot self-generate out-of-scope work. After the contracting officer gives authority to proceed, there is a presumption that all tasks started are in scope. It is critical to examine all relevant formal and informal communication between parties. For the benefit of reviewers, list communications such as letters and emails and summarize what was said. Conclude whether the contractor requested direction and if direction was provided by the contracting officer. Step 4: Substantiate all claims. If it is the program’s first REA, the contractor may not recognize the need to provide any evidence in support of the REA’s claims. My contractors built REAs just like any other proposal: They predominantly were written by the business team focusing on cost data and pricing labor hours, so the impact basis of estimate was well supported. Justifying the claim was given cursory treatment by contracting staff, if not ignored completely. Resist the temptation to handle this in negotiations—making the contractor write down its justification will force it to think matters through. By this point, looking at scope and contractual direction should give the action officer an idea about where the evaluation will end up, but it is still necessary to analyze any evidence provided by the contractor. Analyze the logic and applicability of arguments and contract interpretations. 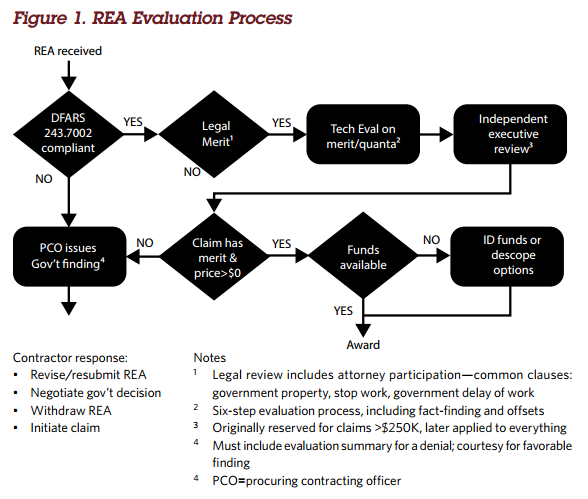 If the REA justification is weak or nonexistent, be clear in the writeup about what is missing. The contractor has a duty to minimize out-of-scope work and perform in-scope work first. When operating where REAs are being generated, the government PM needs to embrace this principle—it provides the only downward cost pressure for an REA. Contracting normally relies on competition or negotiation backed up by engineering expertise to secure fair prices for the government, but REAs have no such protection. If the contractor allows out-of-scope, unnegotiated work to occur in place of negotiated work defined by the SOW with the expectation that it can be reimbursed through an REA, the government has lost control of the program. Another consequence of minimization is that negotiating an REA is not simply a matter of negotiating actuals. For example, if the contractor decided to perform the work with Level 5 engineers but could have used Level 3s, the government is fully justified in taking exception. If this were in-scope work, cost would have been controlled first by negotiation and then by cost incentives. With an REA, the minimization principle is the primary lever. From a practical standpoint, this step is an extension of the previous one. However, there is value in keeping this step separate so that a reviewer can easily see which costs were substantiated in Step 4 and what incremental adjustments were made in Step 5. If the government has any reciprocal or offsetting equitable adjustments against the contractor, this is where positive and negative dollar amounts cancel each other out to produce a lower or zero net payment. Theoretically, the government could press that other claim against the contractor separately and receive funding back (similar to a descope proposal), but this is so rare I have never seen it prove worth the effort. Despite this, the government should never give up leverage on contractor performance—it is still valuable. Where the contractor refuses to drop the REA, a trade gives the contractor PM something to sell to his or her corporate management. The trade doesn’t need to be dollar exact— the flexibility afforded by negotiations could allow the contractor PM to make the trade fit even when the amount supported by government analysis is lower than the contractor’s original request. The REAs my team dealt with generally fell into two categories—some sort of problem with GFP or proposal assumptions being violated. We spent many long evenings weighing various factors to determine how much liability fell in the government’s corner. In one case, our contractor started in-scope work and continued working even past the point where the contractor considered it to be out of scope. The contractor received a buggy GFP software delivery for integration into the weapon system, but the software code required extensive troubleshooting, repeated attempts at integration, and integration of multiple drops once the software was fixed. Although the work was in scope, they made a good point that they didn’t sign up for unlimited integration costs in their fixed-price proposal. Nobody knew what constituted a reasonable upper limit, but we all theoretically agreed one existed. In this case, the auto-generation principle decided the way forward: As soon as the contractor thought work was out of scope, it should have stopped and requested direction before proceeding. Finishing work, later deciding it’s out of scope, and submitting a REA is irresponsible. In another instance, low-quality GFP also caused the contractor to work less efficiently than it had bid. We all agreed it would have been impractical to request direction. The contractor had a fairly strong case when this happened, except that the SOW, not proposed price, determines the limits of scope. To allow otherwise is to reward the contractor for low-balling the bid. This is especially true if the bid was competitive (it was) and the GFP condition is not documented in the contract (it was not). At the end of the day, the government met the letter of the contract. The argument was bolstered with an “experienced contractor” standard—an experienced bidder should always expect some level of integration difficulty. In a final case, a subsystem provider underbid the amount of integration support (software bug-fixes) required for the quality and maturity of their offering. The contractor planned to do this work during system integration but did not win the integrator contract, putting all parties in an awkward position. In pushing the contractor to comply with the SOW and continue bringing the subsystem up to specification, we discovered the practical limits of fixed price contracting. The contractor sent an REA claiming the extraordinarily high amount of support required exceeded its interpretation of the SOW. This REA did derail the program, and we were at the point of deciding between litigation and finishing the weapon system. The government sustained the request and finished the system. Although supporting an REA is disadvantageous to the government, the objective of this process is not to summarily crush all REAs. It was designed to produce a transparent position all parties can understand. Sometimes even airtight logic isn’t enough to satisfy the contractor. They are accountable to corporate management, financial, and shareholder concerns and may not be free to simply drop an REA if the corporation sees a reasonable chance of success. 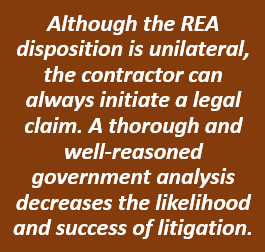 Although the REA disposition is unilateral, the contractor can always initiate a legal claim. A thorough and well-reasoned government analysis decreases the likelihood and success of litigation. When it comes to building a weapon system, contractor and government PMs are in it together. The contractor’s decision to send an REA and the government’s disposition both take place in the context of the larger relationship. I have seen government PMs give away the farm in the interest of maintaining a good working relationship, and I have seen working relationships degrade to the point of yelling phone calls and slow progress. It’s important to navigate between extremes with full understanding of the short- and long-term costs of a decision to support or reject a contractor’s request for equitable adjustment. 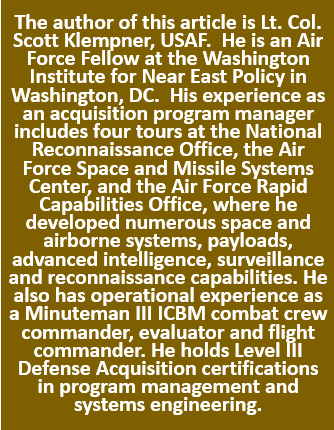 The views expressed in this article are those of the author and do not necessarily reflect the official policy or position of the Air Force, the Department of Defense or the U.S. Government. Faced with an epidemic of deadly roadside bombs in Iraq and Afghanistan, U.S. military officials ordered up a fleet of V-hulled 16-ton armored behemoths in 2007 to help protect American soldiers and Marines. At a cost of $1 million each, the ugly tan beasts known as MRAPS have saved countless lives and absorbed or deflected thousands of insurgent bomb blasts in teeming cities, desert flats and rutted mountain roadways. The lumbering vehicles are so beloved that soldiers have scrawled notes of thanks on their armor. So why would the U.S. military suddenly start chopping up as many as 2,000 of the vehicles and selling them as scrap? After all, just six years have passed since high-tech MRAPs were developed and 27,000 of them cranked out and shipped in a $50-billion production blitz. As it turns out, the Pentagon produced a glut of the mine-resistant, ambush-protected trucks. The military brass has now calculated that it’s not worth the cost of shipping home damaged, worn or excess MRAPs to bases already deemed oversupplied with the blast-deflecting vehicles. As they are “demilitarized,” many of the MRAPs are sold as scrap metal to eager Afghan buyers. It costs about $12,000 to crunch and dispose of a single MRAP here, said Mark E. Wright, a Defense Department spokesman. To ship one back to the U.S. and rebuild it to current standards would cost $250,000 to $450,000, he said. Selling the vehicles as scrap instead of shipping them home and refitting them will consequently save about $500 million, Wright said.